Thanks to this craziness, my children play with my childhood toys and I can pick from my Great Grandmothers ballgowns. Even down to the pots I use to cook in, where passed to me from my Nana! 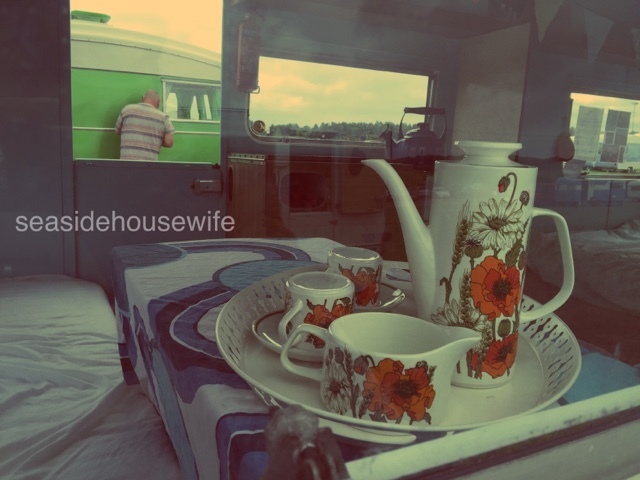 Then along came Daisy.....a 1969 caravan. Mmmm. I know very little about the 1960's apart from mini skirts and the Beatles. So I've been feeling a little out of my depth, when it came to wanting to keep the Caravan looking original. Great Great Uncle to the rescue! He brought me this beautiful Meakin 1960's coffee set! It's me too a tea! ;) I love coffee and this little set is such a colourful indulgence! Best of all, there is quite a bit of this style out there, so I know what will be top of my birthday list this year! Am looking forward to getting more to add to my set. The colours and style are perfect for Daisy. It's really helped me to feel inspired to get Daisy finished! While am on the hunt for beautiful retro items for Daisy, I've been thinking about her finished look. I want to keep her looks original but want to update, and show off my personality at the same time. 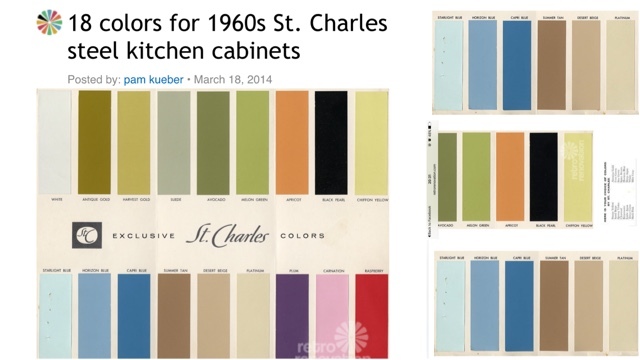 Showing all these amazing 1960's kitchen colours! Some of the colours I already had in mind for her are here, so will be matching these to off the shelf colours I can find now! It's very hard, to get the balance right between wanting to update and make Daisy mine. But keep her amazing 1960's original look! I so upset that the last owner, had already pulled her her curtains and soft furnishings out. It would have been great to have an idea of what colours where used. A lot of beautiful old vans, have a load of paint thrown at them and some cute pillows and then sold on. Thinking that it's increased the value. This is often not the case, you will struggle to replace original fixtures and fittings. So be warned, don't just throw it all out and then regret it later! 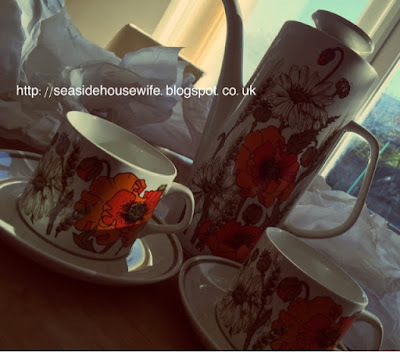 Am loving this china set for Daisy, and finding more all the time! 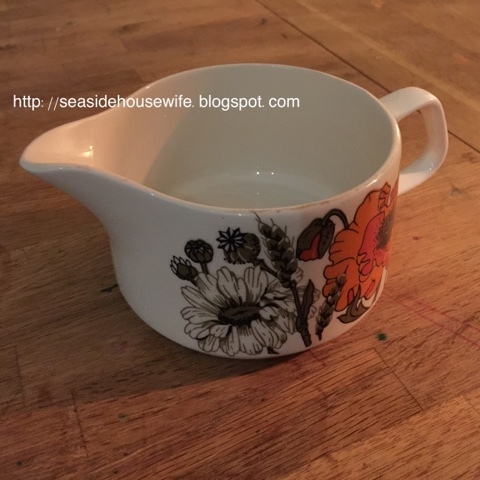 I've managed to add a gravy jug and a milk jug to my set. Now am after some plates! Many people use china in their caravans, my Grand Parents always did with their static but I guess they didn't have to worry about weight! 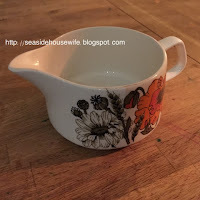 I love using real china, not plastic in Daisy. Am searching out matching items for Daisy's dinning set. It's very exciting looking for items which will go in her when we are finished. It's a great way of getting me through this stage of her renovation. Its now the end of the summer and I have managed to find some great items for her. Its lots of fun, hunting for things which will match and I know I will spend the winter months looking as am sure I will be getting withdrawal symptoms from using her! Daisy on show for Retro Fest! The set look fab when she is on show, and like all her 'props' they are used and loved. Here is the set on top of my Nana's 1960's table cloth. Which I have had for years, it looks amazing in Daisy. Another great find, was this Le Creuset kettle. Its wonderful, I love the sound it makes when it boils, looks fab and in keeping with the van but you can still pick them up new. 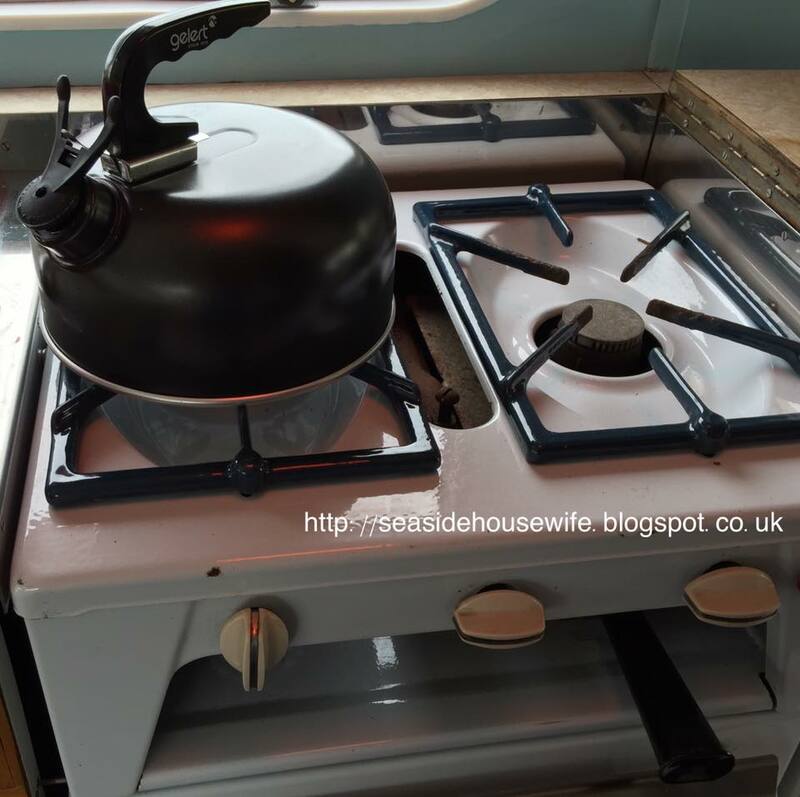 Click here for my review on this fab big kettle! 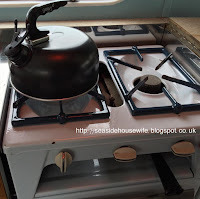 You can see how much better our new kettle looks, compared to our small camping one! The new one holds at least double the water so I can now fill up a few hot water bottles at once! Being me, it was lovely to pass on this kettle to some of our friends who are starting out camping and didn't have a kettle. So important to pass on things! Making her curtains and pillows, has been lots of fun. Though its hard work finding the perfect retro fabric to match her. I have had to settle with the idea that she wont have 6 matching curtains! These blue and while pillows are imported French 1960's fabric, I have covered my self. 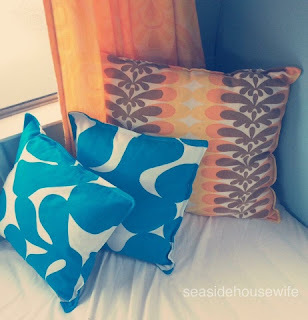 Click here for how to make an easy pillow case. The amazingly retro orange ones where a find on ebay! I managed to cover a pillow and make one small curtain for her door. You never know what you will find in a charity shop or boot-fair! Look what I found, vintage but never used and still with stickers on, pans. 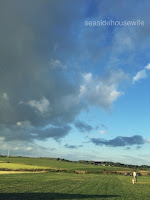 I have a little list in my head of what I need for Daisy so when am out and about, I can keep an eye out. Am trying to end up with a second set of everything. As I've lost count of times I have forgotten the peeler or tin opener! I want to match her, so 1960/70's are best. You really have a relic, a porcelain on steel set belonging to 2000 collection manufactured in 1965-1970. 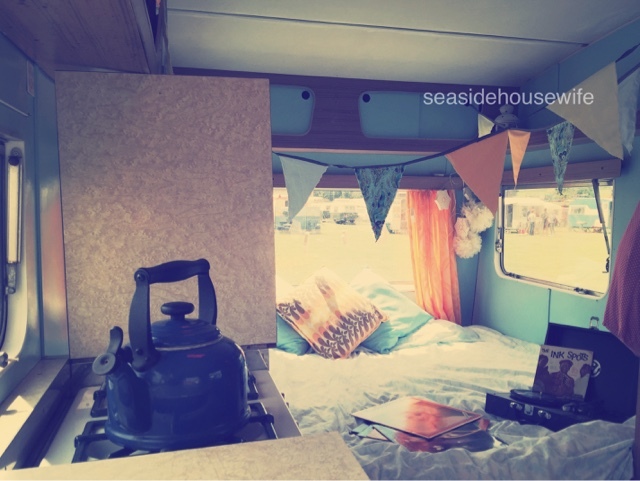 If you want to read more about doing up our shed *beautiful 1969 Bluebird Caravan, click here. Fantastic looking kettle. I would love a decent record player/gramophone for the caravan.